Increasingly the segmentation between birders, butterfly watchers, dragonfly watchers and photographers is reducing as interests overlap and there is a demand for books that cover the three popular groups of birds, butterflies and dragonflies. 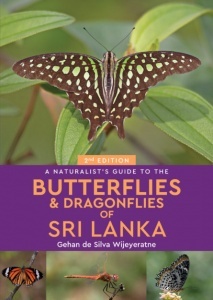 Having written and photographed the guide to the birds of Sri Lanka in the series, Gehan de Silva Wijeyeratne has produced a single, compact and portable photographic guide to the butterflies and dragonflies of the country. The emphasis in the 280 species featured is on the commoner species, covering around 90 per cent of the species that a visitor is likely to see. It is also an excellent book for residents to learn about the commoner butterflies and dragonflies before progressing to more advanced technical books. The guide is focused on field use to help beginners and experts identify species and provides information on their distribution and habitats. As identification of butterflies and dragonflies require a different approach, the two sections are done as two mini photographic field guides with common introductory sections to wildlife watching in Sri Lanka. The book includes information on the key wildlife sites, general introductions to the biology of dragonflies and butterflies, up-to-date checklists with local status and useful references for people who wish to progress further with their study of these charismatic and photogenic animals. Gehan de Silva Wijeyeratne is one of Sri Lanka’s most high profile wildlife personalities. He is passionate about Sri Lanka’s natural history and has authored and photographed over 300 articles for national and international newspapers and magazines on Sri Lankan biodiversity, travel and business topics. His many books include Wild Sri Lanka and A Naturalist’s Guide to the Birds of Sri Lanka also published by John Beaufoy Publishing.